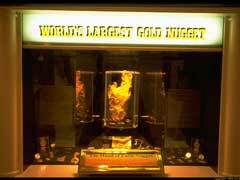 Finding the largest gold nugget is the ultimate goal for any gold prospector. Over the history of gold prospecting quite a few discoveries were made but some natural gold nuggets stand out the most. The largest gold nugget ever discovered was called the Welcome Stranger, however , there were other large and nonetheless interesting gold nuggets that also made claim to fame that are worth mentioning.Many experts vary in their opinions as to whether a certain piece of gold is a true gold nugget that’s why we feel it’s important to mention the following 7 gold nuggets and their brief history. 1. Welcome Stranger is the largest gold nugget ever discovered from alluvial gold deposits in Australia in 1869. Its refined weight was registered at about 2,300 troy ounces. Back in the days miners had no proper equipment to access a gold nugget of this size and it was later broken into 3 pieces, melted into gold bars and sent to the Bank of England. With the current gold price per ounce being $1,872 as of September 6th 2011, the Welcome Stranger can be valued for at least $2,433,600 without taking into consideration its historical significance. 2. Welcome Nugget is another gold nugget that was uncovered in Australia in 1858 and was weighted at 2,217 troy ounces of gold. Welcome Nugget was discovered quite by chance without the use of any gold mining equipment on a roof or a gold mining tunnel. Welcome Nugget was briefly a displayed at the Crystal Palace in London. Later it was acquired by the Royal Mint and melted down to souvenirs. 3. The Hand of Faith is the largest gold nugget unearthed by means of a metal detector in Australia in 1980. The Hand of Faith gold nugget naturally resembles the shape of a giant hand and weighs at almost 875 troy ounces. The Hand of Faith is proudly displayed at one of the casinos in Las Vegas. 4. Holtermann Gold Nugget (est. 5,000 troy ounces) was the largest single piece of gold (matrix) ever discovered in the world on the territory of Australia in 1872 from reef gold streak. Some experts believe that because Holtermann gold is not technically a nugget and it can not qualify to be named the largest gold nugget ever discovered. Bernhardt Holtermann founded one of the most successful gold mining companies in Australia, however, after discovering the massive gold matrix he quickly invested the funds and started following his true passion, photography. 5. Alaska’s Centennial Gold nugget is considered the largest gold nugget discovered on the territory of Alaska in 1998 and weighting at 294 troy ounces. This nugget was unearthed quite by accident during bulldozer operation. 6. Willard nugget is the largest nugget of gold ever found during the California Gold Rush era in 1859 that weighted 54 lbs. The original was very soon melted after its discovery, however, many replicas exist in various gold mining museums in California. 7. Sacramento Gold nugget may not be the largest gold nugget out there, however, it is one of the largest among the nuggets that are still in existence and were not melted down. Weighing in at 100 troy ounces, it was auctioned off in Sacramento, CA for $400,000 in March of 2011 for almost twice the price of its actual gold value.